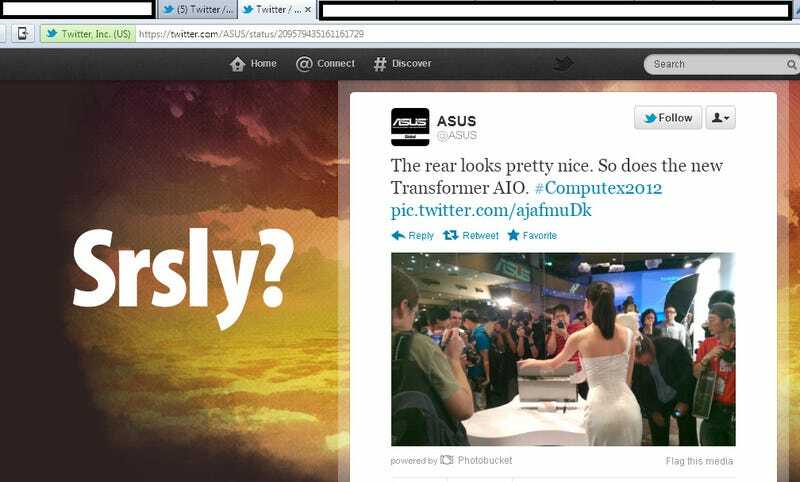 Taiwanese electronics manufacturer Asus just posted and then deleted this tweet showing a photo of a model showing a laptop, wearing a tight night dress that accentuates a very good figure: "The rear looks pretty. So does the new Transformer AIO." Get it? GET IT? Come on, Asus. Grow up. I remember when I was young and stupid and used to joke about Samsung ninja models cladded in tight clothes holding shiny products. Now I'm old and stupid, but those jokes just fall flat.